Chronic myelogenous leukemia is cancer that starts inside bone marrow, the soft tissue inside bones that helps form blood cells. The cancer grows from cells that produce white blood cells. CML most often occurs in middle-aged adults and in children. It is usually associated with a chromosome abnormality called the Philadelphia chromosome. It takes many years to develop leukemia from this cause. However, most people treated for cancer with radiation do not go on to develop leukemia, and most patients with CML have not been exposed to radiation. CML causes rapid growth of the immature blood-forming cells (myeloid precursors) in the bone marrow, blood, and body tissues. The chronic phase can last for months or years. The disease may have few or no symptoms during this time. Most people are diagnosed during this stage, when they are having blood tests done for other reasons. The accelerated phase is a more dangerous phase, during which the leukemia cells grow more quickly. This phase may be associated with fever (without infection), bone pain, and a swollen spleen. A physical examination often reveals a swollen spleen. A complete blood count (CBC) shows an increased number of white blood cells. A medicine called Imatinib (Gleevec) is the first treatment for everyone with CML. Gleevec is a pill, taken by mouth. It is associated with very high rates of remission and survival. New medications similiar to Gleevec include dasatinib (Sprycel) and nilotinib (Tasigna). Sometimes a chemotherapy medicine called hydroxyurea (Hydrea) is used temporarily to reduce the white blood cell count if it is very high at diagnosis. 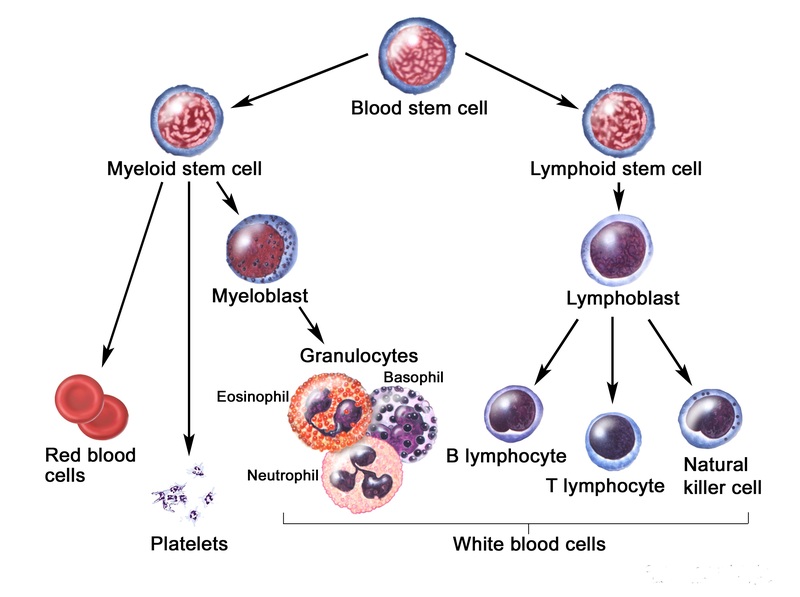 The blast crisis phase is very difficult to treat, because it is marked by a very high count of immature white blood cells (leukemia cells). It is treated similarly to acute myeloid leukemia (AML) or acute lymphoid leukemia (ALL). The only known cure for CML is a bone marrow transplant or stem cell transplant. You should discuss your options in detail with your oncologist. Kantarjian H, O'Brien S. The chronic leukemias. In: Goldman L, Ausiello D, eds. Cecil Textbook of Medicine. 23rd ed. Philadelphia, Pa: Saunders Elsevier; 2007: Chap 195.